Aberdeenshire Holiday Cottage Portsoy, Ideal for Dolphin watching to seeing the Northern lights. Contact us to book your seaside break today. WELCOME to our Aberdeenshire self catering holiday cottage in Portsoy. For the perfect self catering Aberdeenshire holiday cottage come to Creel Cottage, 26, North High Street, Portsoy on the breath taking Banffshire coast. 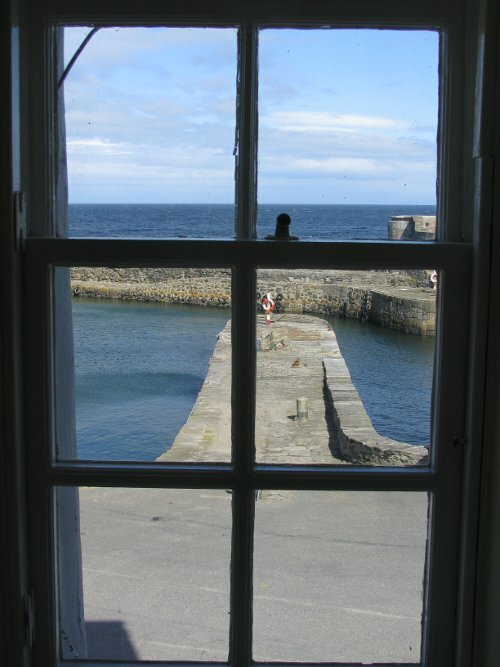 Portsoy is on the north coast of Aberdeenshire in north east Scotland. It is a small historic town established in the 17th century and ideally positioned for exploring the beautiful north Aberdeenshire coast also known as the Banffshire coast. The area is renowned for its stunning coastline, wildlife, castles, golf and whisky. 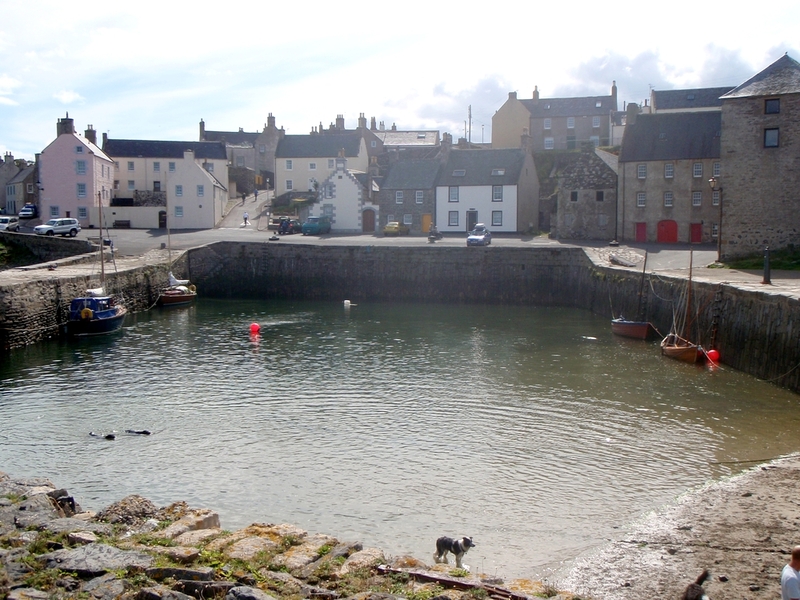 Portsoy sits on the long distance Sustrans cycle and walking route. The cottage comfortably sleeps 4 to 6 in a double bedroom, twin bedroom and an upstairs lounge which can serve as a dedicated third bedroom. There is a further large lounge on the ground floor. The views from both lounges are breathtaking with uninterrupted views of the sea. The cottage also has a fully equipped kitchen and a bathroom with bath and shower over. Creel Cottage is the perfect Aberdeenshire holiday cottage base for seeing the abundance of wildlife that Aberdeenshire is world renowned for. It is not uncommon to see a dolphin or passing whale. The Moray Firth is home to one of the three schools of dolphins in the UK. Harbour porpoises and minke whales can also be seen in the summer months. The headlands abound with puffins, kittiwakes, gannets, guillemots and other sea birds. Seals can be seen bathing on the rocks a few miles further along along the coast. During the mackerel season mackerel can be scooped out of the harbour by hand. In the winter the northern lights can sometimes be seen. The Moray Firth is an officially designated SAC (Special Area of Conservation). Aberdeenshire is known as “Castle Country” because it has more castles per square mile than any other county in the UK. Aberdeenshire boasts 300 castles and the landscape around Portsoy is no exception being dotted with castles including the ruins of Findlater Castle and the Palace of Boyne and the privately owned Fordyce Castle all within a mile or two of Portsoy. The 17th century Duff House is open to visitors in Banff as is Fyvie Castle further inland. Creel Cottage is one of the more historic Aberdeenshire holiday cottages dating back to the 17th century not long after many of Aberdeenshire's castles were built. Portsoy is close to many golf courses including Royal Duffhouse Golf course in Banff, Royal Tarlair Golf course in Macduff and Cullen Golf course in Cullen. For an extra charge we can arrange golfing breaks. Please contact us for further details. Sailing boats can be seen in the harbour and there are marinas close by in Whitehills, Banff and Lossiemouth. Sailing courses are available in Peterhead and Findhorn. It is possible to swim in the harbour in Portsoy but the main large sandy beaches can be found at Sandend, Banff Links, Sunnyside Bay and Cullen beach. Walking, cycling, surfing and canoeing are all popular sports in the area. There is plentiful fishing available in the world famous Salmon river of the Spey or sea fishing off the Banffshire coast. Just outside Portsoy is the revived Glenglassaugh Distillery. Whisky tours are available and their own malt whisky can be purchased. The distillery has recently opened a Visitor centre, shop and café. Further afield there are the world famous distilleries of Glen Fiddich, Macallan, Glen Moray to name just a few. Enquire at the time of booking if you would like us to arrange a whisky tour for you. Aberdeenshire is famed for the northern lights as it says in the popular folk song “The northern lights of old Aberdeen, mean home sweet home to me”. Our Aberdeenshire holiday cottage has uninterrupted views to the north and out to sea which is the ideal location for seeing the northern lights. The northern lights can be seen best in the winter months when the skies are dark. Read on to discover why Creel Cottage in Portsoy is the perfect Aberdeenshire holiday cottage for your holiday. Read about what the cottage has to offer, find out about the many things to see and do in this area of Aberdeenshire and look at the many pictures in our gallery. For prices and availability click here. Then just contact us and your perfect Aberdeenshire break by the Moray Firth will be assured.